Anyway, the Jaywalkers are done! Oddly, the second one has more mistakes design features than the first one. 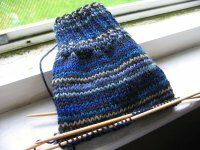 I think I was more stressed out while working on the second one, and probably not paying quite as much attention since it was no longer my first sock. :-) I'm not 100% thrilled with how these fit -- as you can see, they're a little baggy in the ankle -- but I haven't yet worn them, other than to take this picture, so I'll reserve judgement until they've gotten some use. 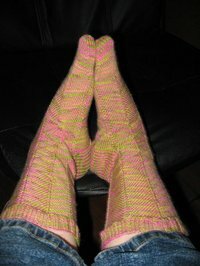 On my trip yesterday, I started another sock. These are just plain stockinette. I'm using a pattern from Yankee Knitter as a reference for numbers of stitches and whatnot, but I'm sort of winging it. The yarn is one of the balls of Regia Stratocolor that I got at Webs. These are going much faster than the Jaywalkers, thanks to 25% fewer stitches, larger needles (2s instead of 1s) and mindless stockinette in the round. On my ride down to New York, I got through the ribbing before nodding off and sleeping for the rest of the way; I did all the stockinette on the way home. I *love* the colors in this yarn. I use http://www.photobucket.com/ to store my photos. They are free, allow you to store photos and video and I've yet to reach a limit. I resize all the photos I post down to 602x404 pixels and save them as low-res jpgs, which usually makes the files between 60 and 100k apiece. Great Jaywalkers!!! Love the color of the new socks too. I'm very interested in the pic answers since I'll be dealing with this myself soon.